Division & figures printed on aluminum scale mounted inside plastic casing with magnet for noting minimum & maximum Temp. Principles of operation to allow a true comparison between temperatures taken within the same site, or at differing geographical locations, the thermometers must be exposed in as near standard conditions as possible. - Temperature: -10oC ~ +50oC. - Humidity: 0 ~ 100%RH. - Dial Diameter: 4 inch. Temperature : -25oC ~ +45oC. Humidity : 0 ~ 100%RH. Diameter : 25cm. These Products have the features of advanced structure reliable performance, high accuracy and beautiful appearance. Widely applicable to industrial, Agricultural and civil use. In order to meet the exact requirement of our clients we are engaged in delivering our customers with large variety of Analog and Digital Thermometers. This is highly demanded for its easy usages. We are an Analog Thermometer supplier in chennai. We are having Analog Thermometer in leading brands in competitive price. We are offering to our customers a wide range of Analog Thermometer. 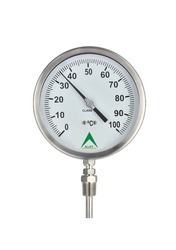 The offered range of thermometers is manufactured by our vendors employing advanced machines, tools and technologies. Available in various configurations, sizes and specifications as per the clients requirements. This is easy to use push button maximum/minimum registering thermometer.